The following post runs through getting SAN certificates for use with Clustered ONTAP. 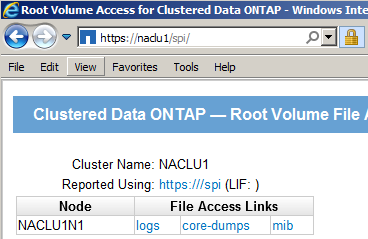 The lab environment has Clustered Data ONTAP 8.2.1 and a Windows 2008R2 AD CS Root CA. To make life nice and easy, we’ll just request one SAN certificate for the entire cluster, with everything we could possibly require in. In DNS we’ve have the following Forward Lookup Host (A) entries. In this example, NASVM1.lab.priv has 2 entries in DNS for round-robin load-balancing. Here the common-name is NACLU1.lab.priv (the cluster FQDN name with NETBIOS name in capitals - doesn’t really matter what the common-name is though since we’re going to append SAN names to it), the other switches are specific to organization. Note: Please keep a copy of your certificate request and private key for future reference. It is important to record this output. The ‘CERTIFICATE REQUEST’ section will be provided to the Certification Authority for generation of the SSL cert. The ‘RSA PRIVATE KEY’ section will be used later when installing the certificate. Note: You will only see the complete output one time - if you later run ‘security certificate generate-csr show’ it actually creates a new CSR under the common-name ‘show’. Copy the contents between -----BEGIN CERTIFICATE REQUEST----- and -----END CERTIFICATE REQUEST----- into a text file and save as say CLUSTER.CSR. Note 1: IE requires IP Addresses after DNS=, other browsers after IPAddress=, which explains the cluster management IP address being in there twice. As prompted, copy and paste in the certificate as contained in the CLUSTER.CER file, and the private key obtained from generating the CSR earlier. Repeat for the node and data SVMs as required. Test over the SPI to logs. 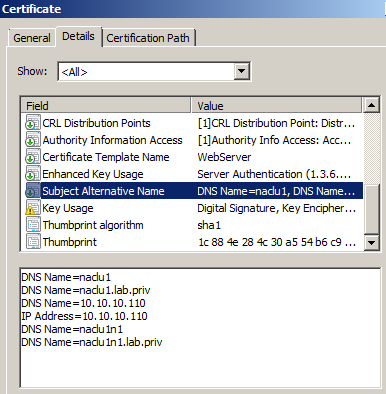 Check the SSL Certificate to see the Subject Alternative Name entries.